Museum records indicate that this species was distributed throughout a considerable portion of the Interior Basin: Ohio and Sciota rivers (Ohio), Wabash and White rivers (Indiana), Sangamon River (Illinois), Tennessee and Duck rivers (Tennessee), St. Croix and Wisconsin rivers (Wisconsin), Cedar, Iowa, Mississippi, and Racoon rivers (Iowa), Little Fox River (Missouri), and Fall and Neosho rivers (Kansas). 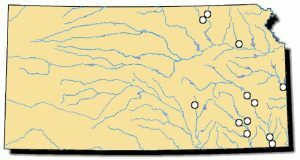 Records from the Kiamichi River, Oklahoma, were previously considered uncertain but were confirmed in 2003. The only remaining populations are in a short section of the lower St. Croix River along the Minnesota/Wisconsin border, the Kiamichi River in Oklahoma and the Ouachita River in Arkansas. This species is imminently threatened with extinction. Comments: This mussel, largely similar to the mapleleaf, differs in having a straight dorsal edge and a pronounced wing sculpted with coarse corrugations. Internally, the nacre is white and the lateral teeth are long, straight and parallel to the dorsal margin. Careful examination of a live shell will reveal the mantle edge has a black margin. This species no longer exists in Kansas and has critically declined across its once broad range within the Mississippi River basin to the extent it is now listed as federally endangered. 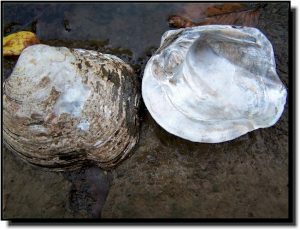 Old shells have been found across eastern Kansas where it evidently once occurred in rivers and large creeks.